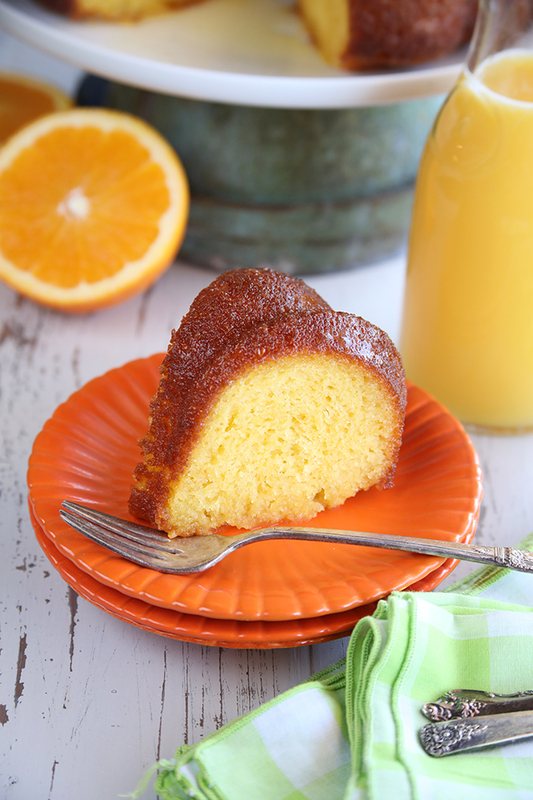 The original recipe for Orange Juice Cake is one that was shared with her many years ago. I’ve made a few minor changes to the recipe over the years, but it remains one of my favorite cakes. 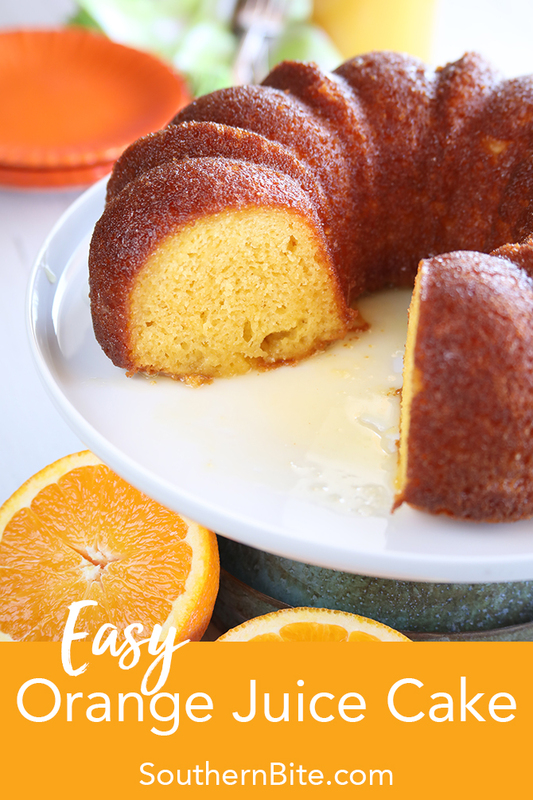 This amazingly delicious cake starts with a simple box cake mix, but is transformed into something that I can only describe as a big ol’ bite of sunshine! It’s been a frequent treat in our family and I just know you guys are going to love it too! 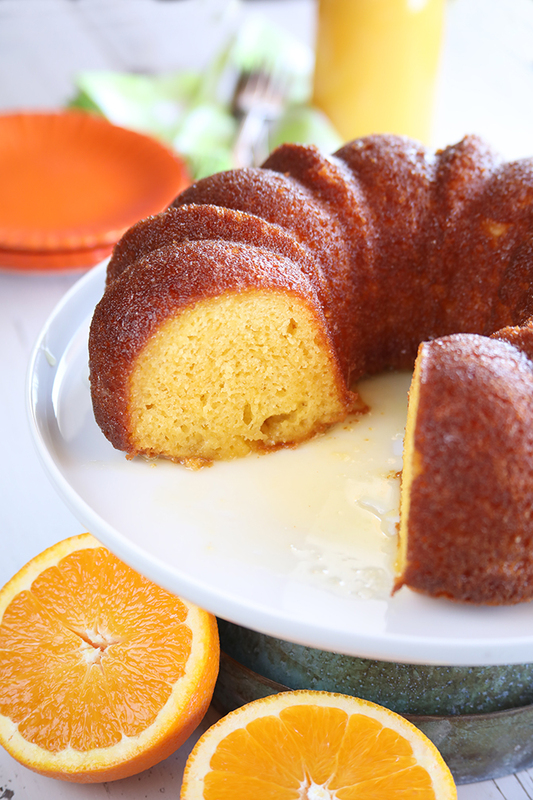 It’s infused with delicious orange juice flavor in the cake itself and in the glaze. That glaze makes this a super-moist, delectable cake that I honestly can’t get enough of. One thing though… resist the temptation to serve it immediately. It will be harder to cut and maybe even a little soggy. Once it has time to soak up and distribute all that delicious glaze, it will be even more delicious! Y’all enjoy! Preheat the oven to 350°F and grease and flour a 10 to 12-cup Bundt pan. In a large bowl, using an electric mixer to combine the cake mix, pudding mix, vegetable oil, orange juice, and eggs. Mix for about 2 minutes. Pour the cake mix into the prepared pan. Bake for 35 to 40 minutes or until a toothpick inserted in the center comes out clean and the cake is just starting to pull away from the sides of the pan. 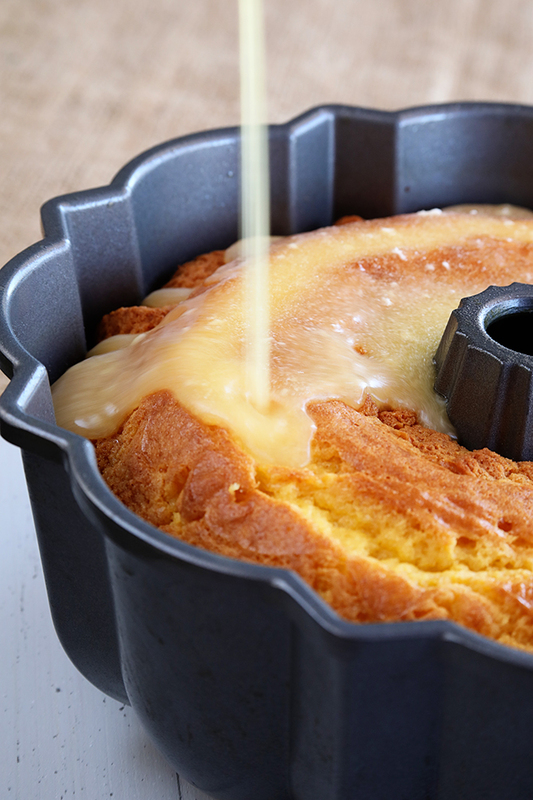 Allow the cake to cool in the pan while you make the glaze. In a small sauce pan, combine the powdered sugar, orange juice, and butter. Cook over medium-low heat until the butter has melted, stirring frequently. Use a skewer or toothpick to poke holes in the cake. Pour the warm glaze over the cake while it is still in the cake pan. It's going to seem like a lot of glaze, but just keep pouring. Allow to cool for 15 to 20 more minutes, or until the cake is cool and most of the glaze has been absorbed, then invert the cake onto a serving platter. Allow to cool completely before serving. This cake is best served after it has rested for about 8 hours. *After much testing, I've found that Duncan Hines cake mixes do not work with this recipe. I prefer to use Betty Crocker or Pillsbury. I used to make this and take it into work. Everyone loved it so give it a try. My mother used to make a “Lemon Supreme” cake that was similar to this. She used a cake mix and added apricot juice. It was a family favorite! Sadly, something was changed in the cake mix and the recipe didn’t work anymore. Are you familiar with that cake? I’ve not heard of that using the apricot juice, but it sounds amazing! What’s the recipe sounds good!!! Hi Can you add Poppy Seeds to this cake? 🙂 With the lemon pudding and orange juice… Just sounds good! 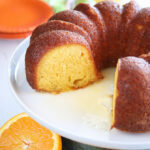 Hubby would like this cake with vanilla instead of orange juice. Any ideas how I could do this? I suppose you could use a vanilla pudding mix and swap the orange juice for milk in each instance. I have used the vanilla pudding but I really don’t think the milk would work. Actually it really doesn’t taste like orangey (not sure if a word) at all. Why do you not think the milk would work? Use sweeten condensed milk instead of the orange juice. I’m not sure you’d be able to find a sugar-free substitute for everything that’s called for in this recipe. can you use orange juice that has pulp? I make this cake and add pecans to the bottom of bundt pan! So delicious! I made this yesterday. My hubby said “This is the best thing you’ve made in awhile”! It reminds me of the apricot nectar cake my mother made when I was growing up. Sooooo good! I highly recommend you make it ASAP! 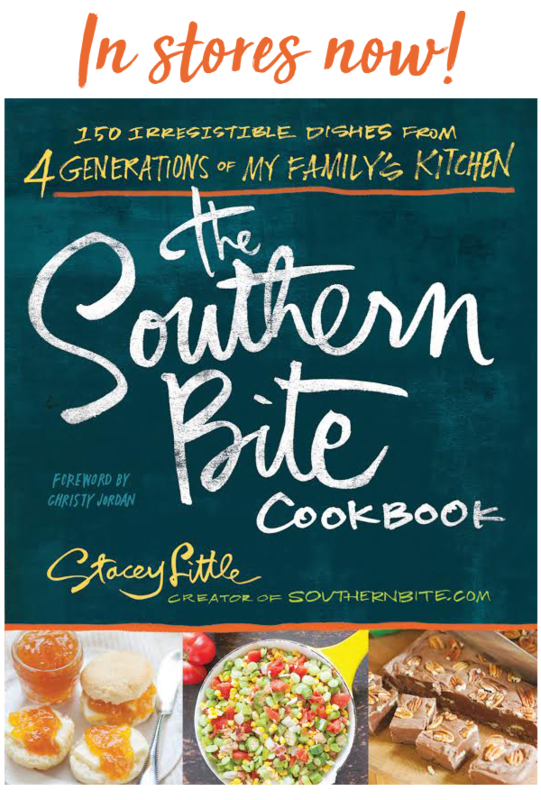 Thanks, Stacey, for another awesome recipe! I just love hearing things like that! SO glad y’all enjoyed it! I made this cake over the weekend, and it was delicious. Very sweet and very moist. Substituted instant vanilla pudding and added fresh lemon juice as this was what I had on hand. Years ago my mom made a similar cake. It was one of those recipes that made the rounds among the church ladies. I believe it had orange Jello mix instead of lemon pudding. She baked it in a 9×13 pan and poked holes all over with a fork so the glaze would soak in. Can’t wait to try this to see if it matches up to my childhood memories. Mix all ingredients for five minutes. In an electric mixer. Pour into a 9 by 13 inch greased pan. Bake at 350° for 40 minutes. Cool for five minutes. Puncture cake top with holes one inch apart made by fork with large tines, ice pick, etc. 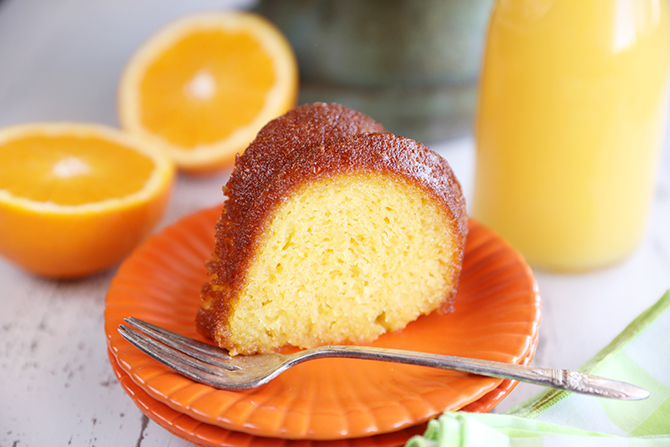 Mix ½ cup orange juice with 2 cups powdered sugar and spread on cake. Serves 15. The cake fell. And no I did not open the over or over mix. Next time I will make it in a 13 × 9 pan. It’s super rare to hear about a cake mix cake falling. Are you sure it wasn’t an expired mix? I just pulled my cake out of oven and it fell as well. Brand new cake mix, not expired. I didn’t open oven door. It smells delicious and I’ll try again, maybe with a different brand of cake mix? I can’t wait to try it! Did you test to make sure it was cooked through? Did it fall in the oven or after you took it out? What brand of cake mix did you use? I just made the Orange Juice cake! Wow! So easy and so good. Everyone loves it. Thanks for posting! Do you keep in fridge or out on counter? It’s ok for a day or so on the counter. But if refrigerate it if you need to keep it longer than that. OMG!!! You did it again! First the Rum cake and now this! Oh and cant forget the Oreo Cheesecake! I made this cake for work and it was a hit and they said Southern Bite and I was like of course!!! This comment brought a huge smile to my face! So glad everyone enjoyed them all! I’m hoping this isn’t an odd question. If I invert the cake onto a serving platter, isn’t the cake now upside down? And if I invert it again to fix it, won’t the top be squashed? If you don’t mind, please exaplain how this is done? No worries! A bundt pan is designed so the cake is actually cooking upside down (per the design) when you use it. So when you invert it onto a serving platter in order to release the cake, you are then releasing it right side up. 😊 Hope this helps! Wondering if you’ve ever substituted butter for the vegetable oil in this recipe? I prefer to add that richness of flavor but don’t want it to be ruined. I know I’d need to up the amount a bit. Thanks! You can, but I actually prefer the moistness of cakes made with oil in most cases. It’s fine on the counter for about 8 hours, but I wouldn’t leave it for much longer. Ever substituted pineapple juice for the orange? No, but it sounds AMAZING!!! I’m going to put it on my list! I made this for our church dinner and brought home an empty plate. Delicious!!! This is a wonderful cake….sweet, oh so moist, just plain yummy! going yo try the orange cake soon, I’ll let you know how it came out. the spice rum we made from molasses. I ‘ll also share that recipe soon. Does the pineapple cake recipe not call for pudding mix to be added to the batter? I noticed the orange juice cake does, so I wanted to be sure. Nope, the pudding in this covers up the pineapple flavor so I opted to leave it out in this version. Any particular reason? And are you talking about in the cake or the glaze? I would love to make this in advance, has anyone tried freezing the finished cake? I found the cake a little too sweet. I may not add the lemon pudding; just start with a lemon cake mix and see what happens. Do you think I could put some mandarin oranges into the cake before baking? Hmmm… I’ve not tried that. My fear would be the additional moisture would change the cake texture. That said, if you do try it, please come back and let me know. This cake is awesome. So moist. I have made 3 of them in a week and half. Do you cover and store on counter or fridge? Ha! So glad to hear you’ve gotten some greta use out of this recipe! I just made this cake with a DC cake mix and it fell. I did not see the notes or comments until afterward. It would be helpful to put that in the ingredient list. Anyway, looking forward to trying it. Would you refrigerate it for storage? It’s ok on the counter for a day or so, but I’d refrigerate if it lasts longer than that. 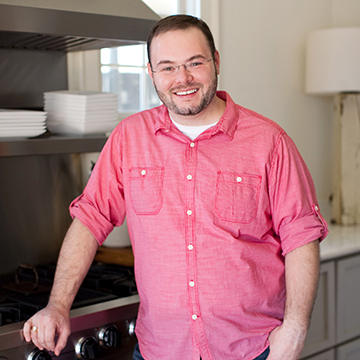 Do you see a way to incorporate Orange Marmalade in the glaze? I am dying to try it, but don’t want to ruin the glaze; however, I guess that is how new recipes are created, right? Will you give me a little guidance on how to do this? Of course it is! I can definitely see replacing some of the sugar with some orange marmalade. Been making this recipe for years, every bite disappears wherever I take it! When I first got the recipe it was called Orange Blossom Special. Thanks for the headsup about the cake mixes! Hope it helps with future cakes! I just made this cake this past weekend. It is amazing! My husband loves it, asked for seconds. Moist and delicious. I live in NC and I want to send one to my son who lives in Georgia. Do you think it’s okay to ship and should I decrease the amount of glaze? So glad you enjoyed it! I’m worried that it might fall apart in shipment with it being so moist. I use Duncan Hines mixes because they don’t already have pudding in the mix. To eliminare issues from rheir formula change, I add 6 tbsp of flour and have no problems. Thanks for the tip. I’ll have to try this.